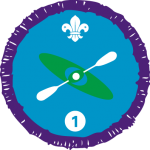 The Paddle Sports Staged Activity Badge can be achieved from Stage One through to Stage Four. If you already hold the British Canoeing’s Paddle Power Start award then you do not have to complete the options below and can use that award as evidence of your skill. If you already hold the British Canoeing’s Paddle Power Passport award then you do not have to complete the options below and can use that award as evidence of your skill. If you already hold the British Canoeing’s Paddle Power Explore Level 7 award then you do not have to complete the options below and can use that award as evidence of your skill. If you already hold the RYA Youth Sailing Scheme Stage 4 award then you do not have to complete the options below and can use that award as evidence of your skill.